I have been watching A Year of Biblical Womanhood develop for over a year. The idea of someone who shares my values (feminism, inclusion, Christianity) and is braver, better informed and a bit ballsier than me going through the bible for everything it says about women fascinated me. And when I say “fascinated” I really mean “relieved me of responsibility.” It was a project I wish I had thought of, but since Rachel Held Evans had thought of it first, I got the insight with none of the having to be all demure and handy around the house. I have always wanted to know the essence of things. The real core at the heart of things. The Prototype. Ur-thing if you will. Time and time again, I go searching for, say, the “real” Arthurian legend behind all the rest only to find there is no such thing. Conversely, I wonder how much can you change a thing before it is no longer that thing? How much can you tinker with meatloaf before it is no longer meatloaf? At what exact point on the color wheel does blue become green? Okay, maybe that one only happens after midnight and a certain amount of alcohol. Maybe there are no answers, but the search is fascinating. A big question that I roll around in my head is What Is It to Be a Woman? Can we come up with a definition of “woman” that includes girly-girls as well as tomboys, straight women as well as lesbians, stay-at-home suburban moms and biker chicks, college women playing soccer and elderly members of the Daughters of the American Revolution, women whose bodies have matched their spirits since birth and women who must work to bring the two into harmony? Is there a definition of women that has room for both me and Kim Kardashian? Add Christian to the definition and that question becomes even thornier. Well, I long ago got tired of giving in to the patriarchy. And that Bible belongs to me, too. And to the lesbians and the biker chicks and the DAR members. A Year of Biblical Womanhood takes it back for us. It celebrates the strong women in the Bible; it honors the women who were destroyed by the patriarchal system they lived in; it points out how many of those “womanly” qualities some would have us believe are a sign of a good Christian woman were intended for good Christians period. 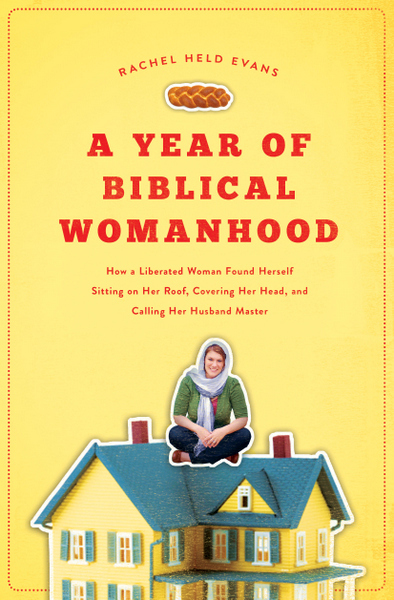 This week I am preparing to lead a book discussion on A Year of Biblical Womanhood. We’ve gathered a group of women from various generations and backgrounds to share a meal and some stories. Although I like the content of YBW, I want to use Rachel’s story as a jumping off point for sharing our own stories. You can follow along with my preparation on Twitter. I will be tweeting a (very) short synopsis of each chapter as I finish it. I will also tweet the questions the chapters raise for me. This entry was tagged Curation. Bookmark the permalink. I don’t use twitter, but I would like to see your synopsis of each chapter and the questions they raised. We are about to read this instead of doing a Bible study in my group and we are at a loss for how to discuss it. We haven’t started yet. Stacie, when are you having your book discussion? I might be able to send you some of my notes. Our discussion was very free-flowing and centered mostly around individuals experiences both with being a woman and with the Bible. Let me know how soon you would need something. My best notes are in the margins of the books. http://www.playeatgrow.com/2013/01/grow-year-of-biblical-womanhood.html. However, if you feel you have something to add, I’d love to hear/see it. Thanks again! Stacie, I have not been able to locate my notes, so let me tell you the general way I approached the discussion. Instead of discussing the a lot of the theology, I urged women to share their stories. We had a group that ranged from mid-20s to mid-70s. Most of our members fell right in the middle. I asked things like: How were your raised? How is that different from how you live or what you think now? What were you told about being a Christian woman? How did the women around you conform or not? I found women loved finally having a chance to tell their stories and hear other women’s. For me, one of the most powerful ideas in the book the question: Why are Biblical rules about men assumed to apply to women, too, but rules about women only apply to women? What if all Christians worked on being gentle and domestic and obedient? Sorry I don’t have more. I hope this helps! Yes it’s helpful. Thank you!